Heels that looked like a ghost pulled from a bed of garish red concrete and construction nails, drawing to mind both iconic Louboutins and bloody toes. Delicate white muslin fused with clear plastic sprouting eyeballs—airy summer dress meets hydra-headed anglerfish—nestled in a sunny patch of ferns. A mint-green velvet dress with an exaggerated collar adorned with crumpled tinsel and a print of young Justin Bieber pinned to the back. 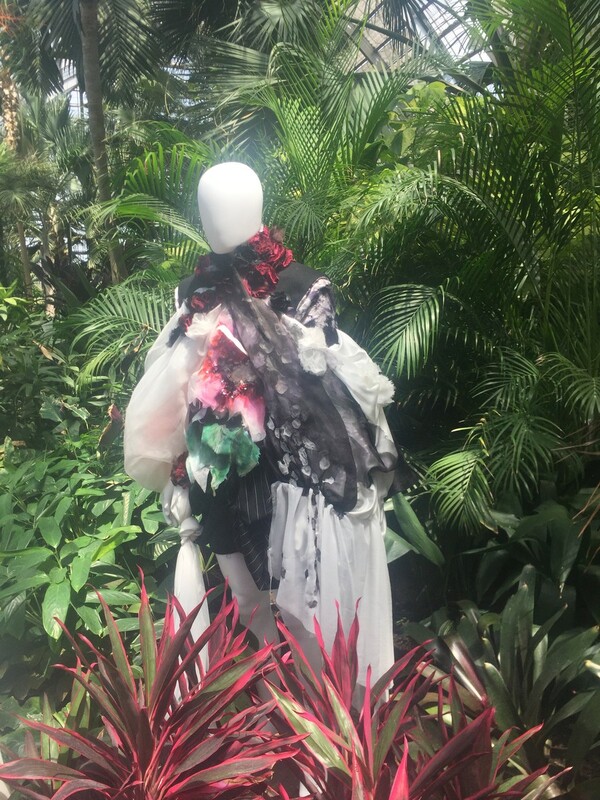 An odd menagerie of headless mannequins found themselves scattered throughout the plants of the Garfield Park Conservatory as part of a showcase by fashion students at the School of the Art Institute of Chicago (SAIC) this past weekend. The exhibit featured the handiwork of nearly 100 second-years, third-years, and fourth-years in a display themed Reflexion, which was “inspired by the Garfield Park Conservatory’s beautiful botanical setting, and seeks to evoke a personal and global reflection about both concept and material use.” Reflexion “explores the future of fashion in a sustainable world,” SAIC wrote on its website. Beyond the clothing and accessories designed by students, the Conservatory also featured several massive light and sculpture installations integrated into the gardens, created by a pair of alumni. There were no signs, directions, or explanations. Each room led seamlessly to another and tucked into winding paths among the palm trees. Mannequins, shoes, and face masks were nestled between downy cacti. Two collections stood guard by the entrance: male models carrying their shoes in their hands faced off against ruffled dress-clad female models looking like they stepped out of an ’80s Madonna-DIY-Harajuku music video set. In the background rose a set of mirrored gates, reflecting the greenery and sunshine seeping in through the glass roof. Sprouting up between huge leafy ferns and gangly palm trees, the clothes in the main room—mini collections created by seniors—took on new lives, like exotic flower species with feathered spines, Nike Air Jordan gas masks, and delicate bamboo-hatched bibs. Descending the stairs into the bright fern room revealed an elegant tableau. 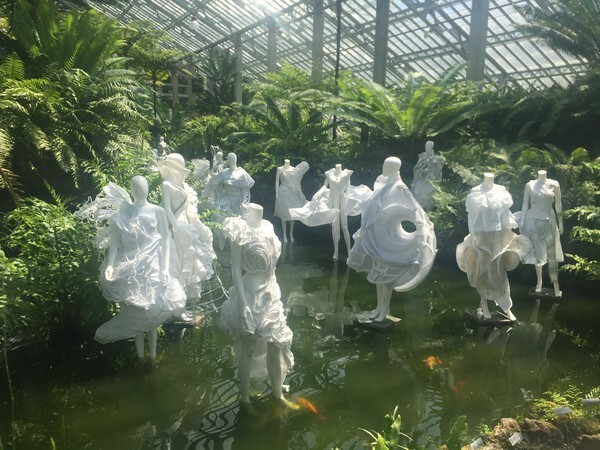 Like a scene out of a Rococo painting, dozens of figures dressed in white appeared to be floating above a rippling green pond. Upon further inspection, new facets emerged in the sea of monochrome. Dresses had pirate ship masts rigged to their shoulders, exposed hoopskirts, elaborate neck ruffs, molded plastic resembling a spiky sea urchin, and metal adornments that, from afar, looked like mussel shells, but could have been ears or lips. A canopy of red and blue interlocking plastic disks distorted the light in another room, creating a sense of intimacy in the large space showcasing work from the seniors. Farther down the path was the cacti room, where hats and shoes created by the juniors were scattered amongst thorny plants. With no signs or specified order, the exhibition invited meandering and introspection. Treading the dirt paths and stumbling upon a grouping of designs allowed for reconsideration of the meaning imbued in clothes. Most of it would not be considered attractive or wearable, not even in a fantastical couture sense. A green taffeta piece best described as a Venus flytrap poncho gave the uncomfortable impression that the fabric was consuming the wearer. A collection that at a distance looked like red, white, and black Power Ranger suits turned out to be cut up and repurposed sneakers forming a muzzle and handbag, perhaps addressing the noxious and overpowering consumerism rampant in modern society. Simultaneously strange and awe-inducing, the avant-garde creations of the students of SAIC were refreshingly creative interpretations of renewal and reflection in an age of fast fashion and trend-driven runway shows.